Today I am introducing a new feature on my blog. You will notice at the top of the home screen an added page marker called Training Tips. 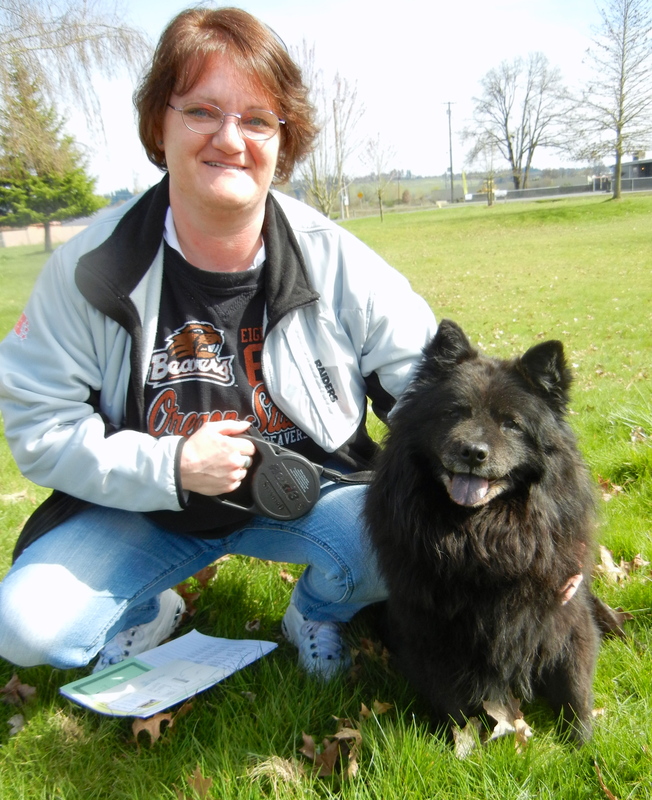 At the suggestion of WHS staff, and with the help of experienced dog walkers, I am developing a series of short training-tip videos for various kinds of shelter dog situations that volunteers experience. 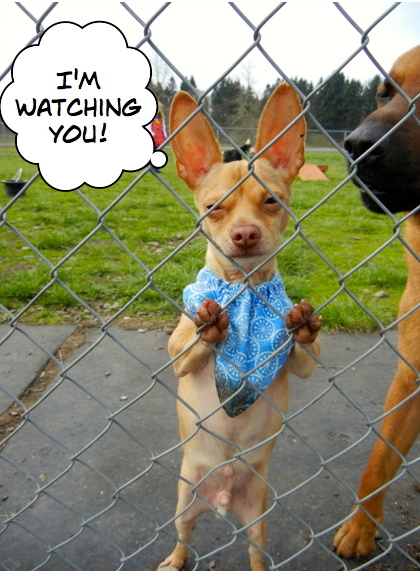 It is our hope that these videos will help dog walkers see how to handle common behaviors seen in a shelter setting. We also hope that these videos will be helpful to dog owners whose dogs exhibit the characteristics we discuss. 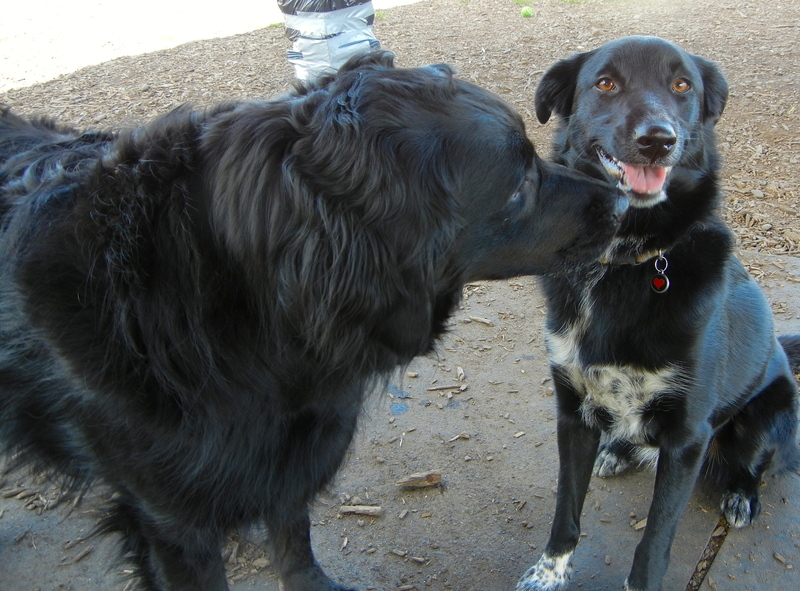 The first one I’m publishing today is about dealing with shy dogs. 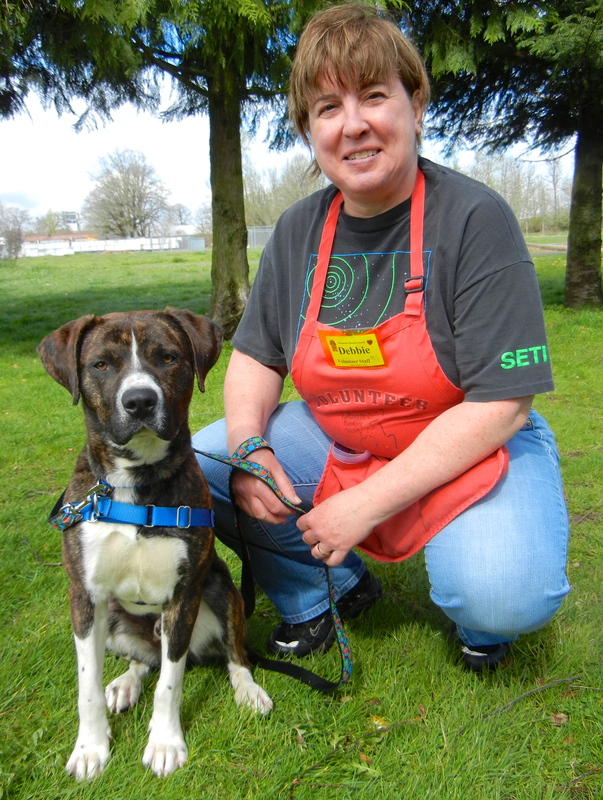 Many of you will recognize Moppy, one of our Brooks rescued dogs, and Linda Crosby, one of our most experienced volunteer trainers of difficult dogs. I hope you watch! 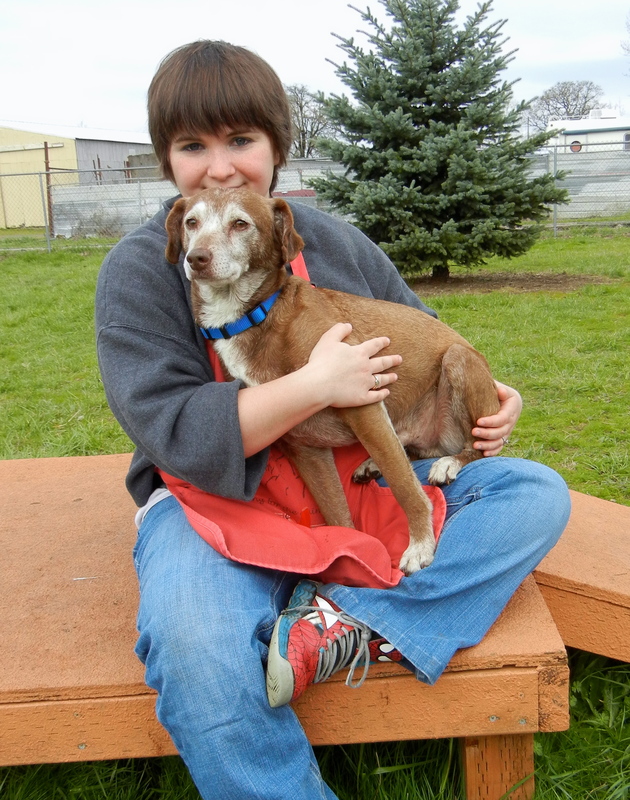 It’s been a wonderful week for long-term and older-dog adoptions! If you read my blog regularly, you are well acquainted with Sachi (formerly Bella), Cassidy, and more recently, Moxie. 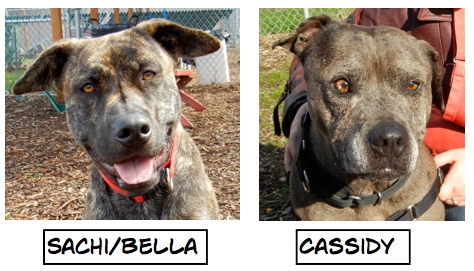 I am here to tell you that all three of these patient dogs found their very own homes! 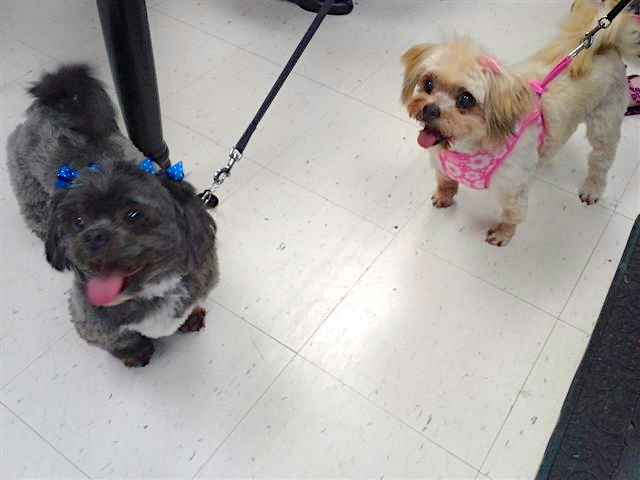 Staff member Kim sent me these pictures of Sachi with her new person. She had been at WHS since December, and was a favorite of many of us, including me. 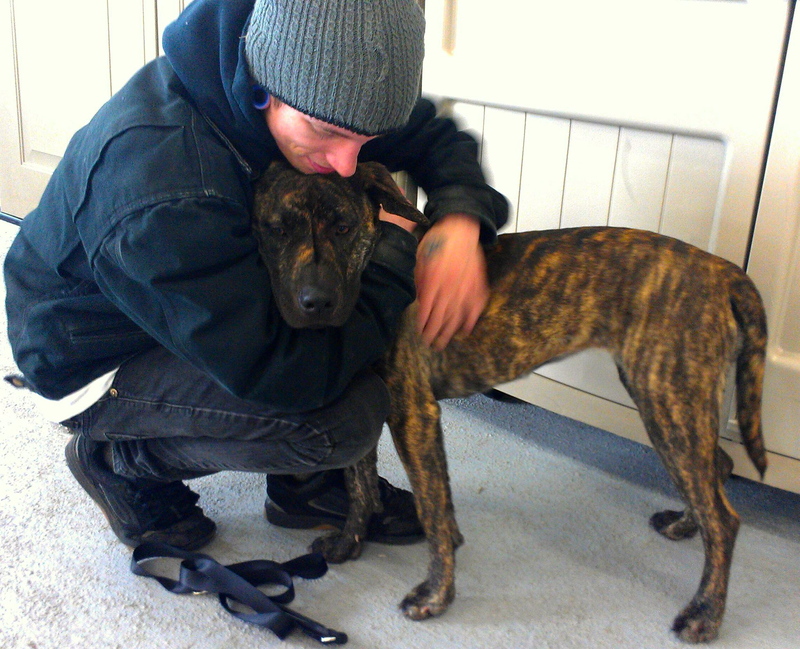 And I happened to be at the shelter when Moxie went home. Here she is with her person who told me Moxie is going to be very spoiled! 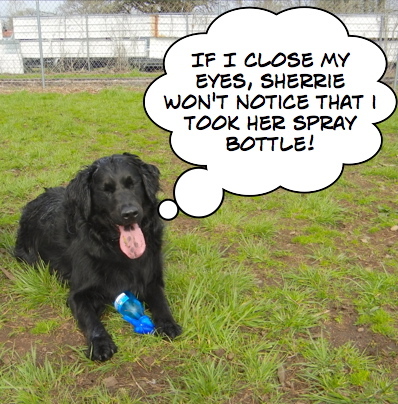 I think Moxie knows it! I always like to take a final picture when a dog is going home. 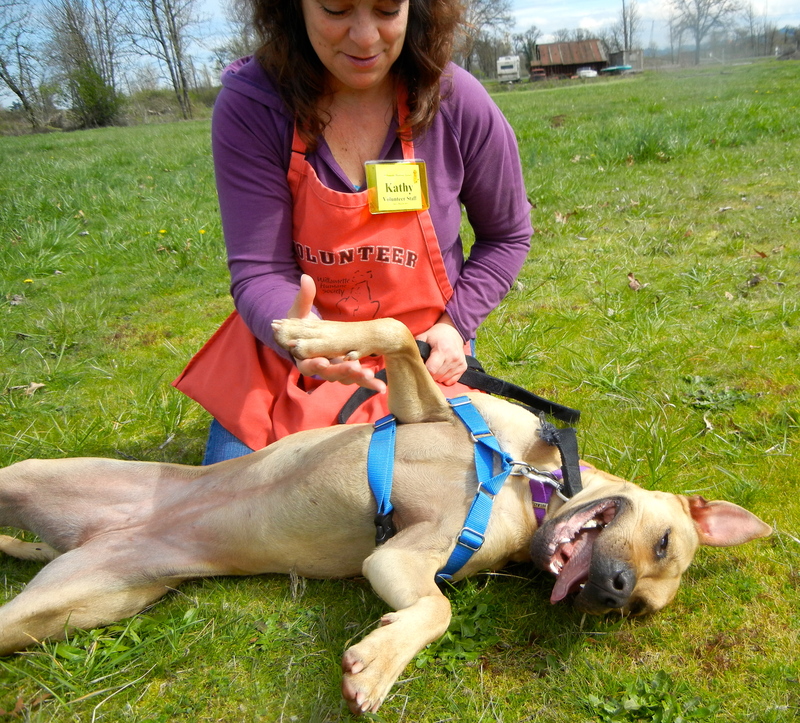 Here are all of the great Blog Dog adoptions during the past week. 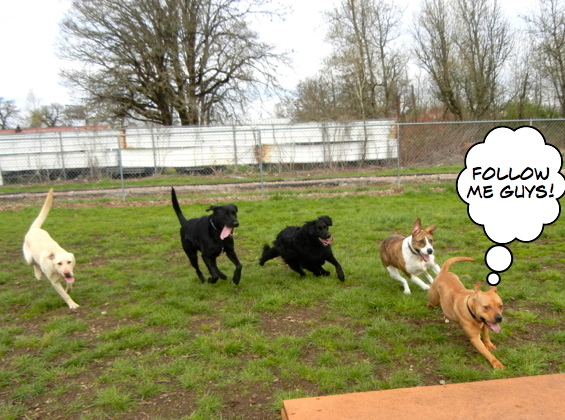 Sunday’s play group was more active than last week’s, but there were still some quiet times. Here’s what I overheard. Remember Ruby from last week’s post? She LOVED play group. She quickly became the leader of the rompers. I’m happy to report that Moppy (former Brooks rescued dog) is getting more confident every day. 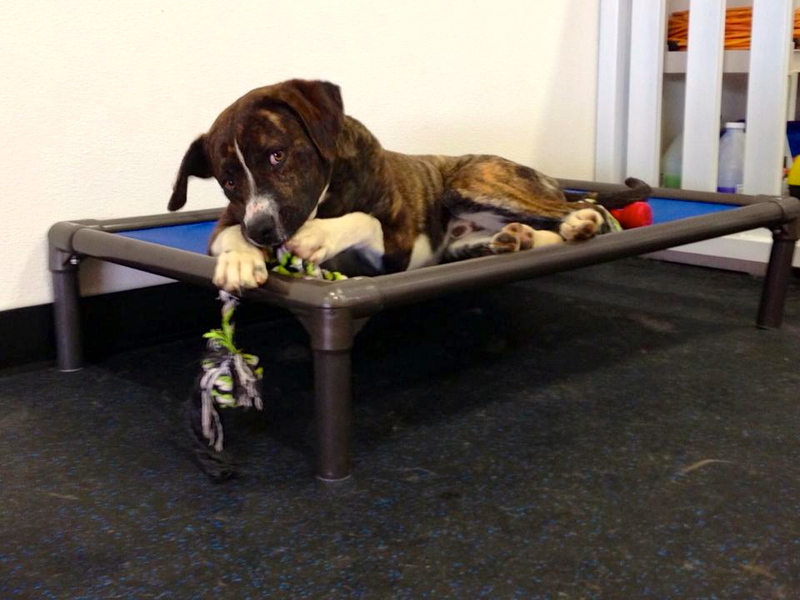 He now comes to the front of his kennel without coaxing and in play group is one of the happiest participants. While taking pictures in the big dog yard, I happened to turn around and saw Icy Hot staring at me. He’s a funny little character and is convinced he is a big dog. I didn’t have the heart to tell him he really isn’t. He’s a three-year-old Chihuahua. 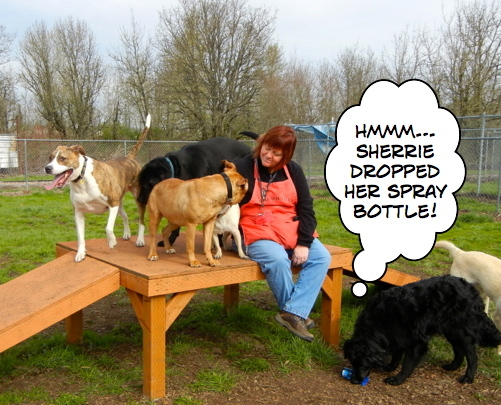 At one point, Sherrie didn’t realize she had dropped her spray bottle. (We use them to remind dogs to use their manners as needed.) While neither she nor I realized it was on the ground, Bentley did. The next thing we knew, there was Bentley far out in the yard with his prize. 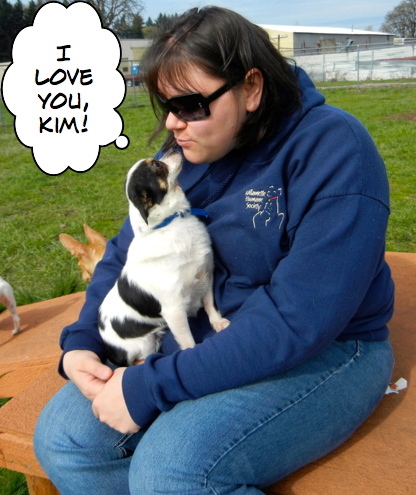 Meanwhile, in the the little dog yard, Riley, a five-year-old Chihuahua mix was having a moment with Kim. 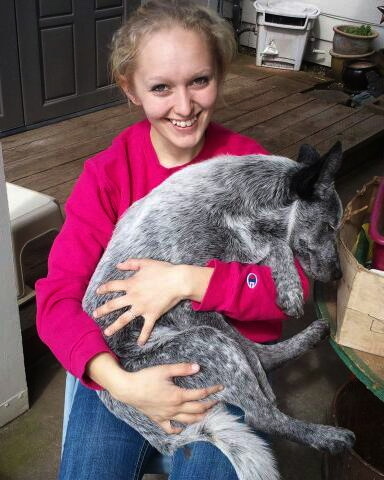 As usual, Banjo enjoyed sitting on Sarah’s lap. Banjo is a nine-year-old Beagle mix. I’m a big guy and enthusiastic! Sunday turned out to be a pretty warm day and Sarah and I spent the afternoon taking pictures of new dogs. 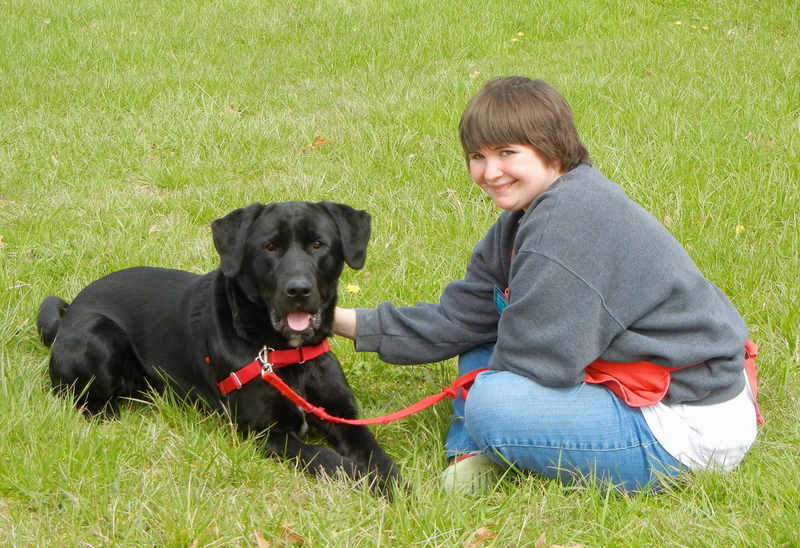 One of them was Dino, a three-year-old Lab mix. 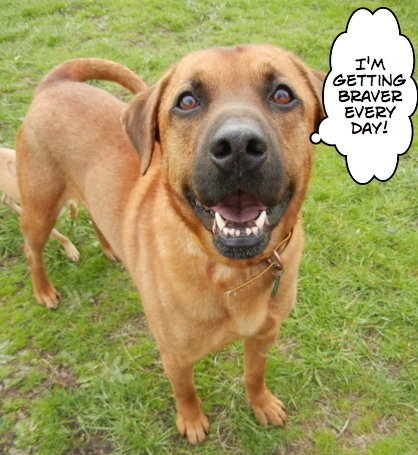 He’ll need a lot of space to exercise in, and he’d love an active family of his own. 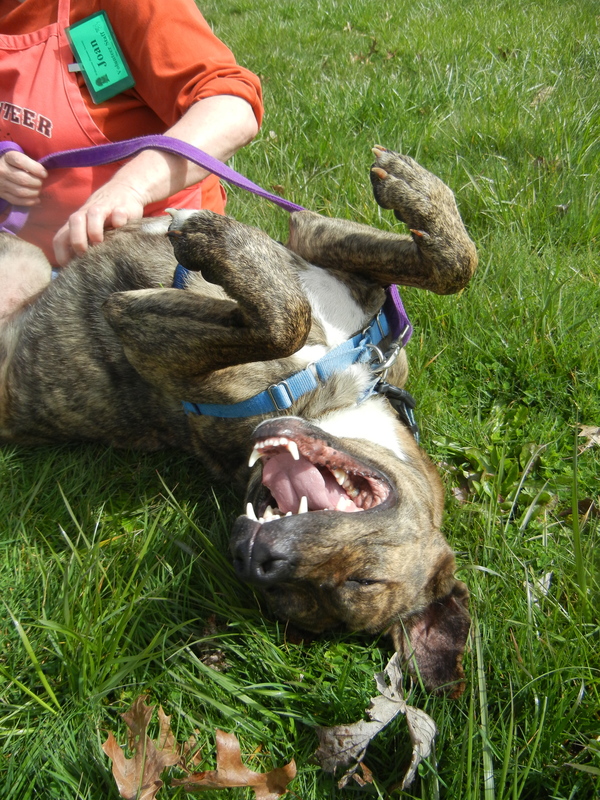 He’s great with kids (because of his size, they should be at least 8), he loves other dogs (he had a wonderful time in play group), and he’s housetrained. He has an engaging personality and knows several commands. 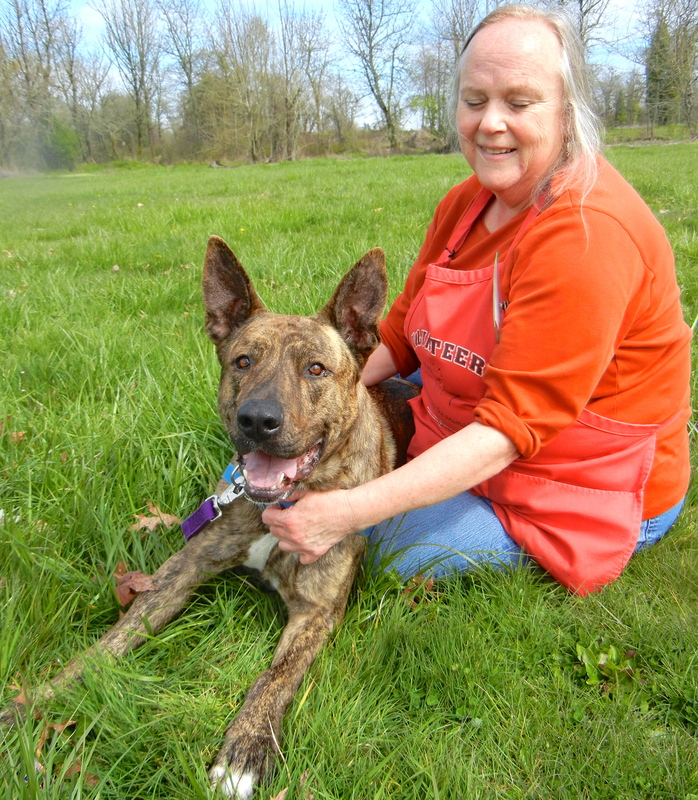 He is really a terrific dog and it will be a lucky family who adopts him! Are you looking for a new Best Friend? 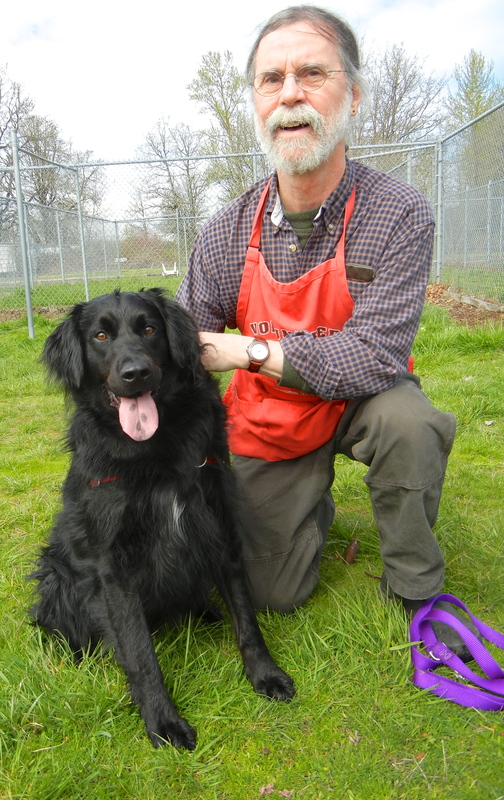 Another new arrival I met on Sunday was Bentley, a one-year-old Border Collie mix. He and Dino had fun romping around the big yard in play group, both have lots of energy. Bentley has been an outdoor dog and would like to become an indoor/outdoor dog, but will need some help with housetraining. He has lived with small children and loved them. 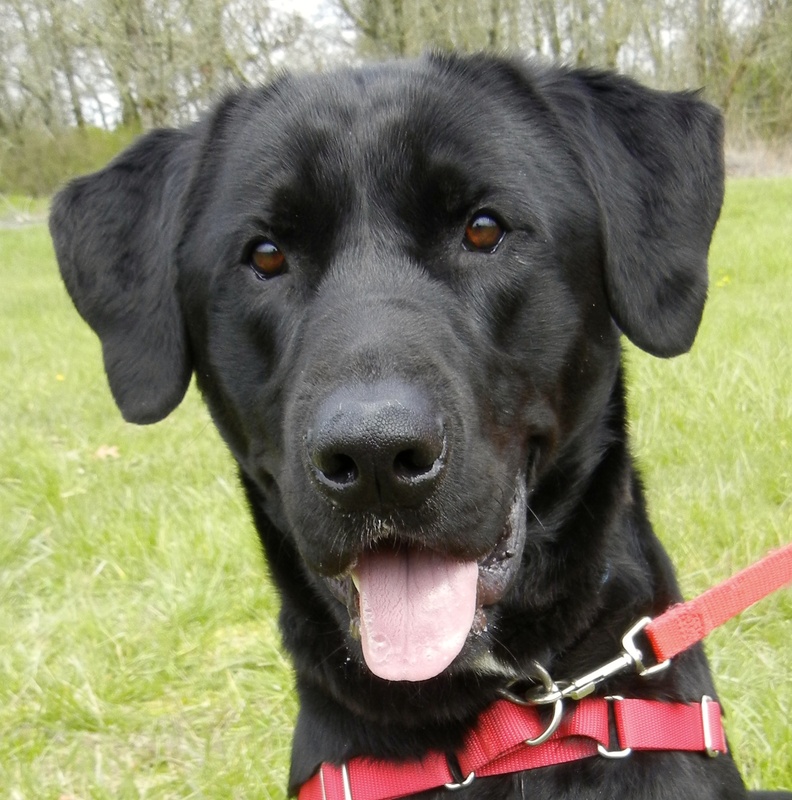 He has a beautiful coat and will make a great family addition. 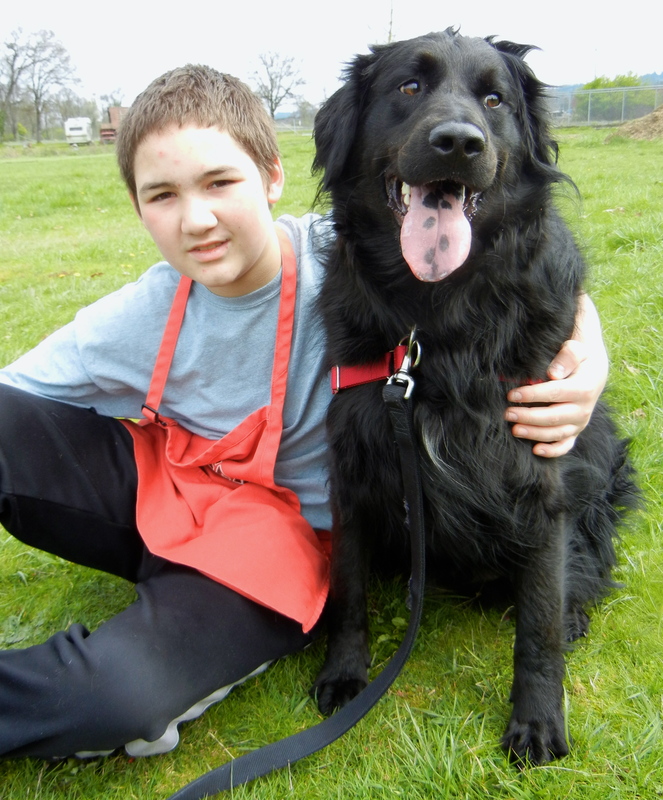 Here he is with volunteer Zack. Here he is today with Steve. After my walking shift today, I took Bentley and Zoe (Volunteer Manager BJ’s dog) out for a play date. Zoe loves to run and Bentley could use some exercise to lose a few extra pounds. Debbie came out to the yard, too, and spent some time with Bentley. He is such a gentle and kind boy who seems to get along with everyone. I’m hoping he is adopted soon by a loving family. I’m new, I’m happy, and I should be your new best friend! I got to meet two newcomers today and was promptly smitten with them both. 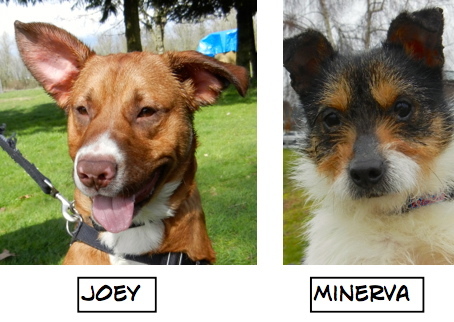 They are from another shelter and arrived at WHS a couple of days ago. 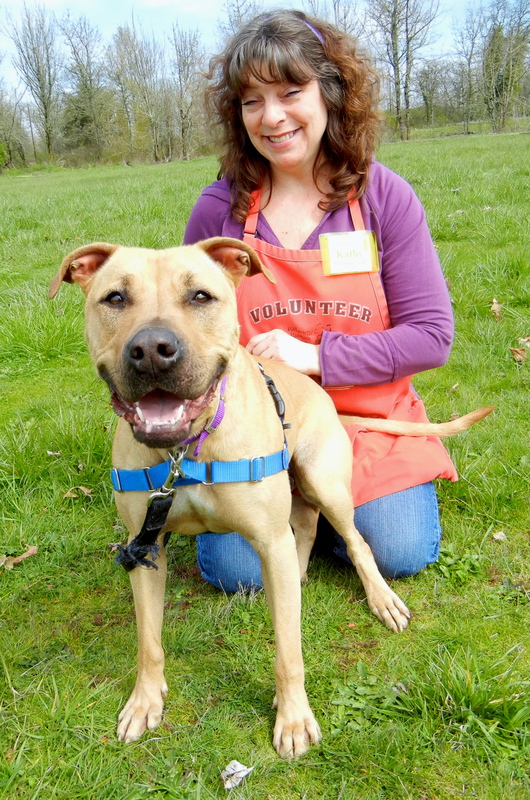 I got an email from one of the volunteers at their previous shelter telling me what wonderful dogs they are and hoping I’ll let her know when they get adopted. I assured her I will. 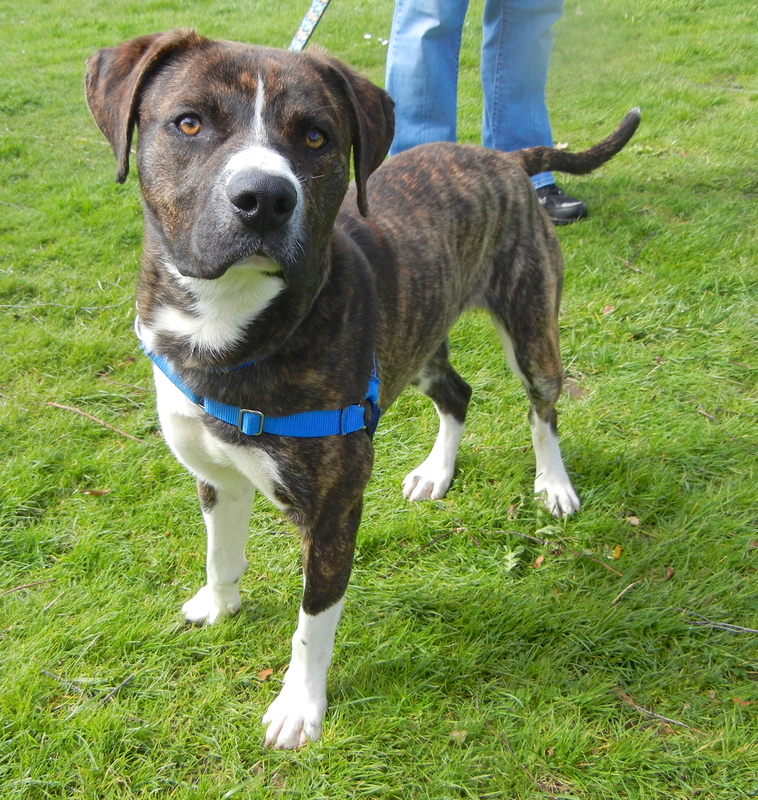 First is Shadow, a two-year-old Pit Bull Terrier/Boxer mix. 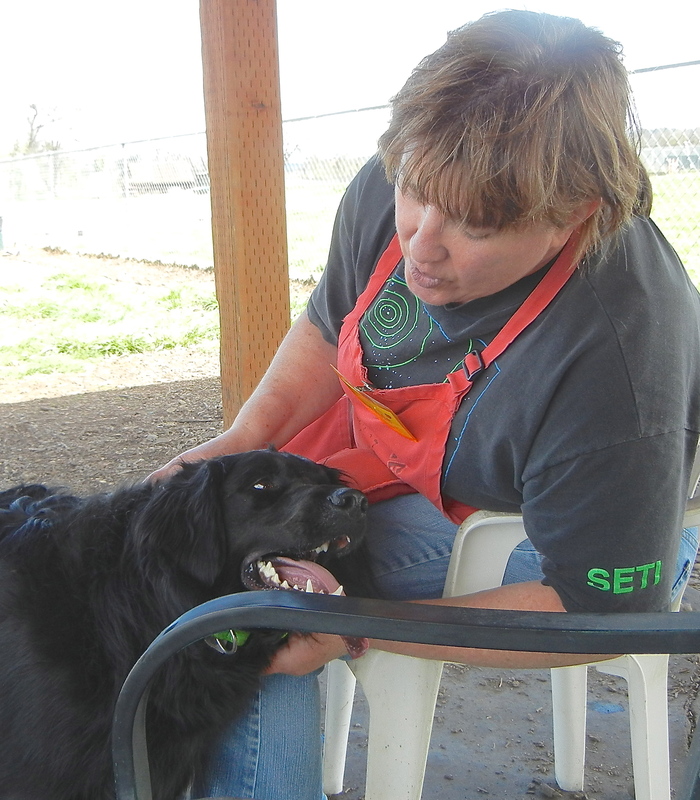 Kathy had her out for some play time and as you can see, Shadow is a very happy girl. She walks well on leash, takes treats politely and is a joy to be around. I’m another newbie and I’m hoping for my forever home soon! Here is a picture she sent along. 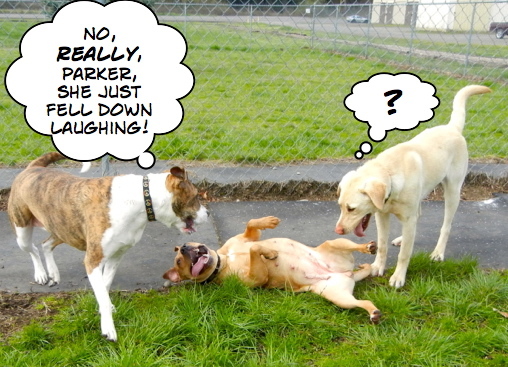 Isn’t it fun how dog lovers network! I’m back again. But I just know that my forever home is out there! Kingston is back at the shelter once again. He is back through no fault of his own. But don’t think that he’s feeling down because he’s back. He’s the same big sweet guy he’s always been. This is a dog who gets along with everyone including kids, other dogs, and…wait for it…CATS! He just needs room enough for his size. Kingston is a one-year-old Shepherd mix. 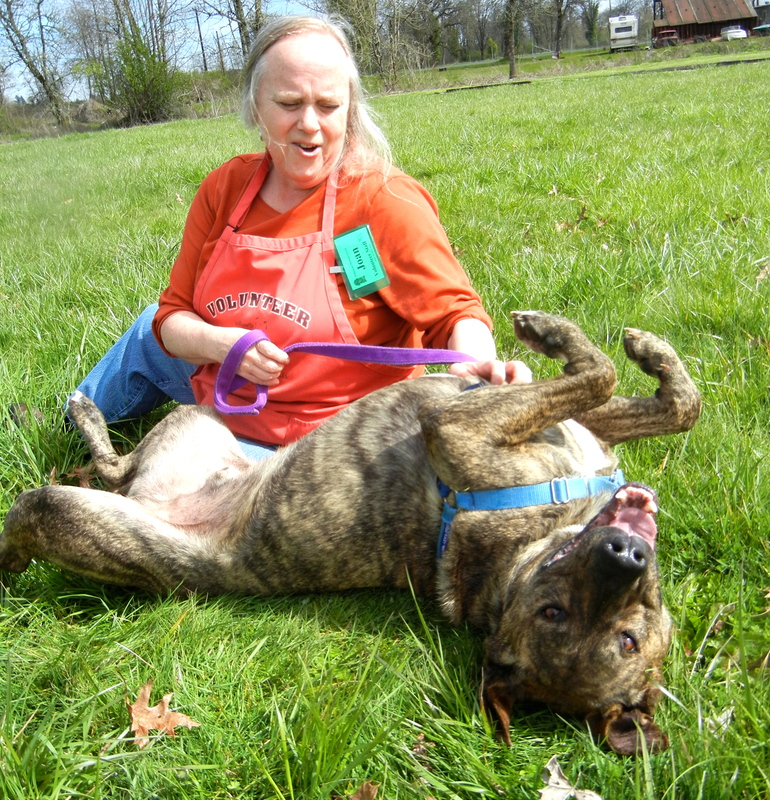 Here he is today showing what a happy boy he is with Joan. 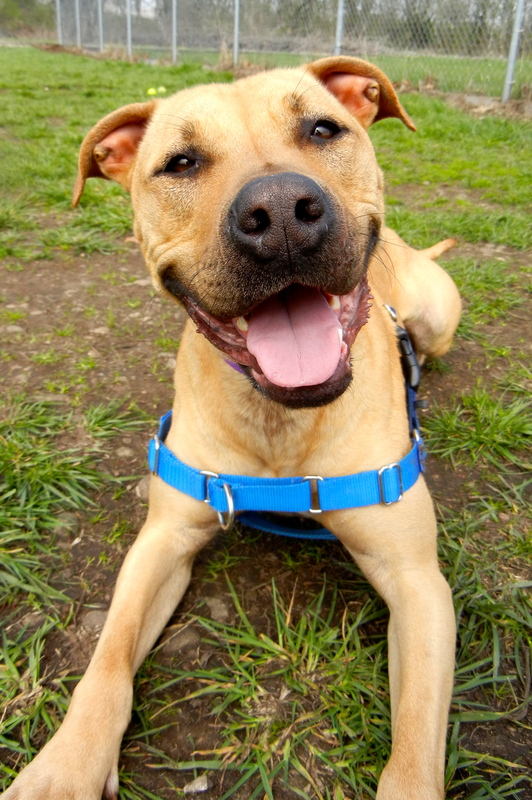 All of Kingston’s fans are hoping that the right family fit will find him soon! Yep, I’m a Beagle. I follow my nose! 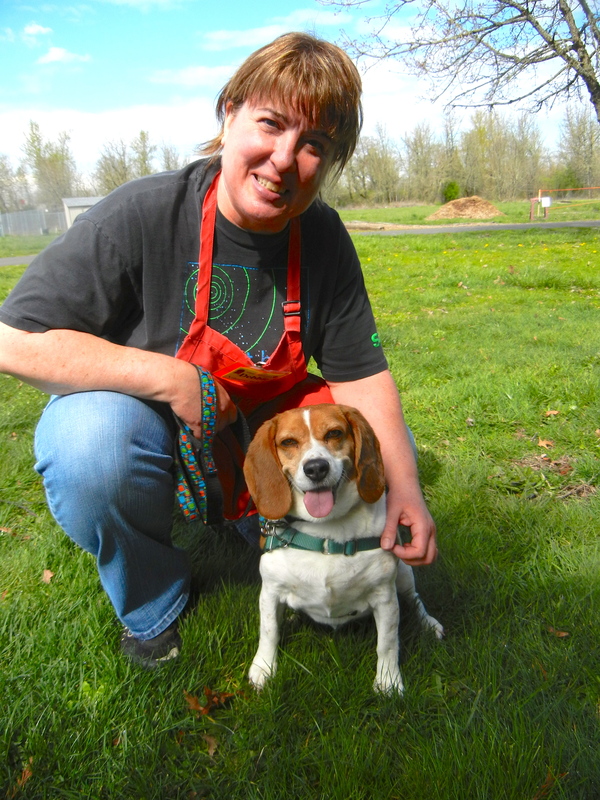 We haven’t had a Beagle at the shelter lately, but meet Chloe, a seven-year-old Beagle mix. As you can see, Chloe is cute and happy. She loves being around people and even kids if they respect her space. However, she has a strong distaste for “those pesky cats” as she refers to them. 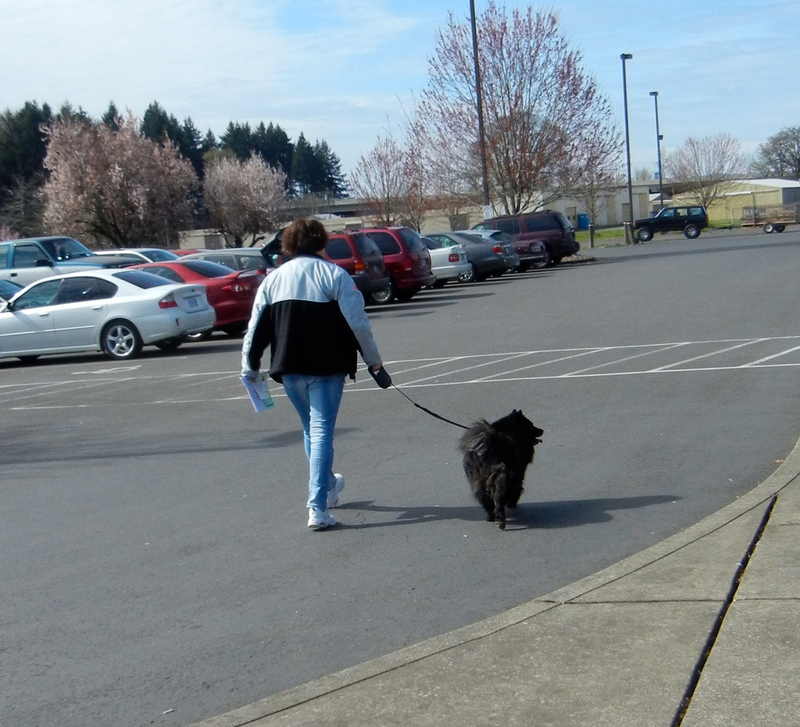 Debbie reports that Chloe walks well on leash and takes treats well. For a Beagle person she’ll make a great friend. I know I have a strange name, but you see, I’m quite colorful! Yep, this is Coloring Book, a one-year-old Terrier mix. 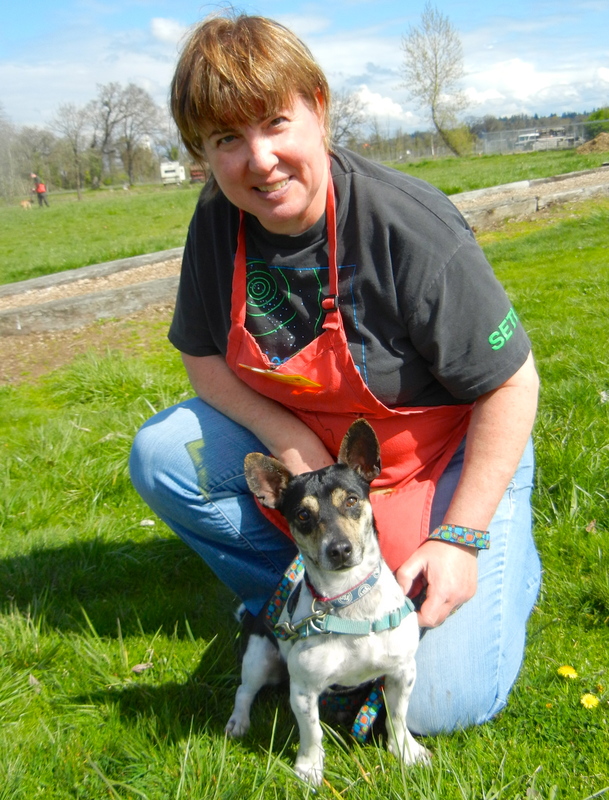 He is a little nervous around new situations, but enjoys people, as Debbie found out. 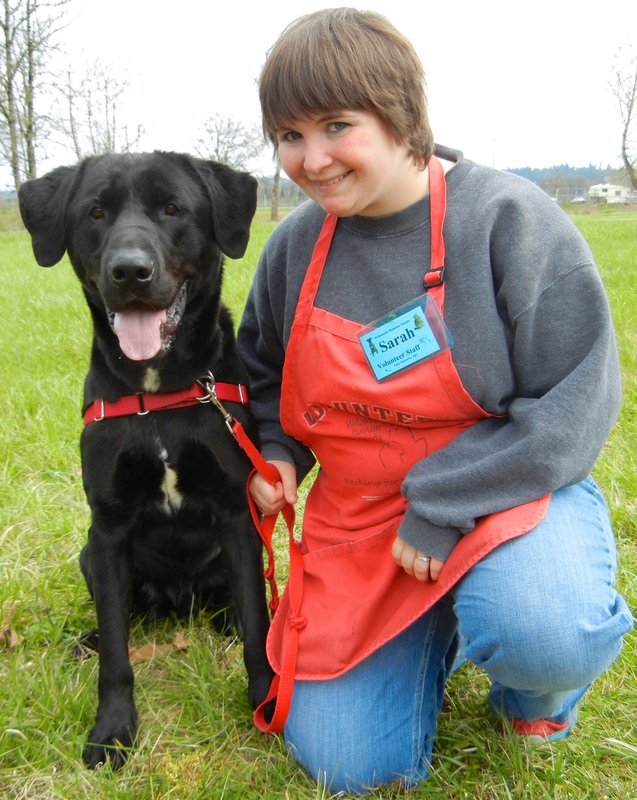 He is affectionate and would enjoy coming to WHS training classes. He took my hot dog bits carefully. He’s a polite little guy. I have several updates to report. First of all, to all the Lucy fans, I have great news! Second Chance Salem, a local rescue co-founded by one of our WHS volunteers, took Lucy into their program from Pittie Pals. 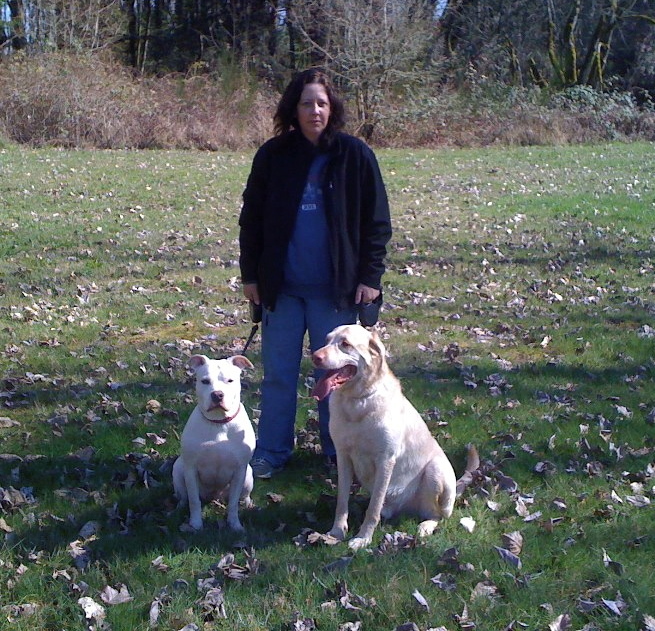 Pittie Pals has done a wonderful job of training Lucy and will continue to be part of her life. 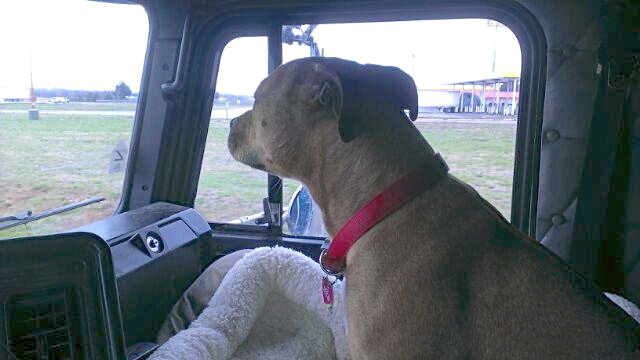 But the very best news is that Lucy has become a Trucker Buddy for awhile with one of SCS’s co-founders’ husbands, who is a long-distance trucker. 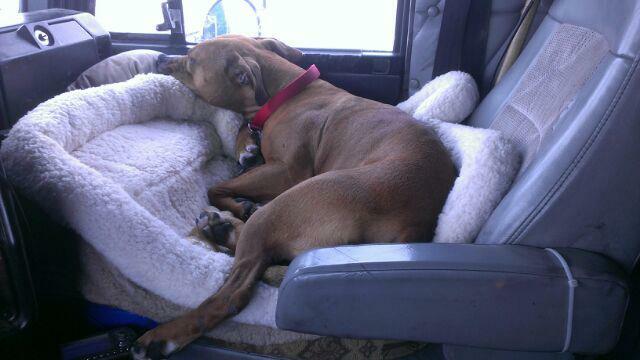 He enjoys having a dog along for the ride and Lucy is his current buddy! She will again be available for adoption through Second Chance in April. What a great way to spend her time while she waits for her perfect family. Here she is on the road. Could she look any more content? I’m always happy when I hear another report about Echo. Last week I got this note and photo. She’s having such a great life! Remember Bebe and Scooper from a few weeks ago? 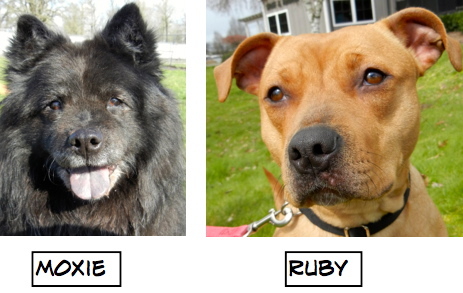 This is how they looked then shortly before they were adopted. They stopped in to say hi at WHS the other day and this is how they look today. Whew! As promised, Moby and Hope’s new owner sent me an update for this week’s post. 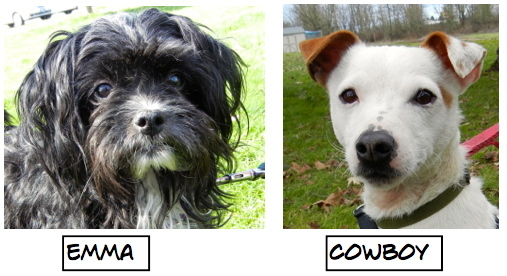 You’ll remember that both Moby and Hope are deaf and were adopted by a deaf WHS volunteer. Here is the update and pictures of this happy family! 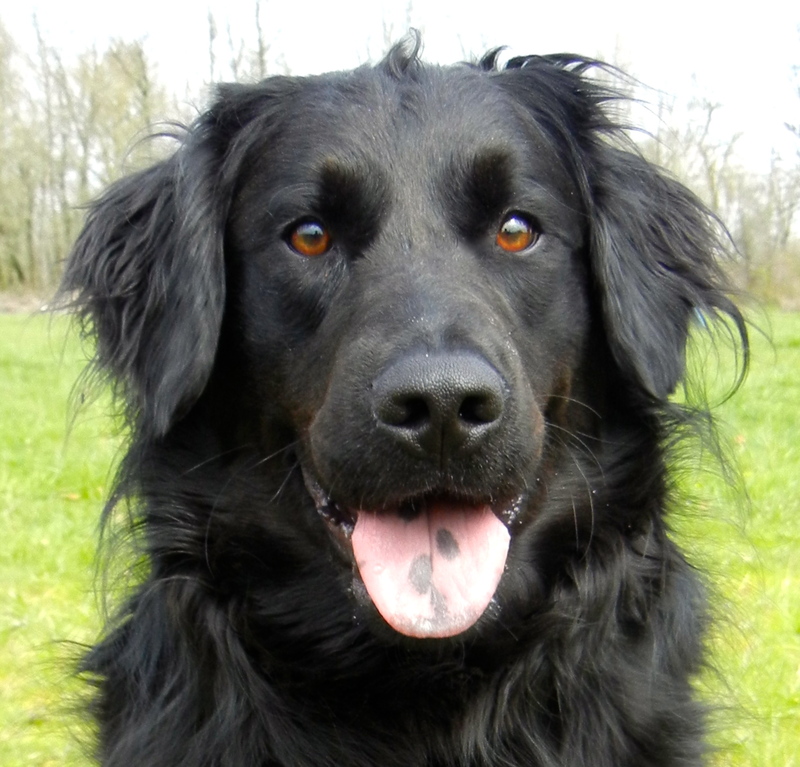 “We adopted Hope on August 26th, 2012 and we just fell in love with her after spending hours with her at Willamette Humane Society. As we visited her in the visiting room, Anthony and I looked at each other with this huge grin and I just knew that we would be adopting her!! Her name was Suket and we changed it to Hope. 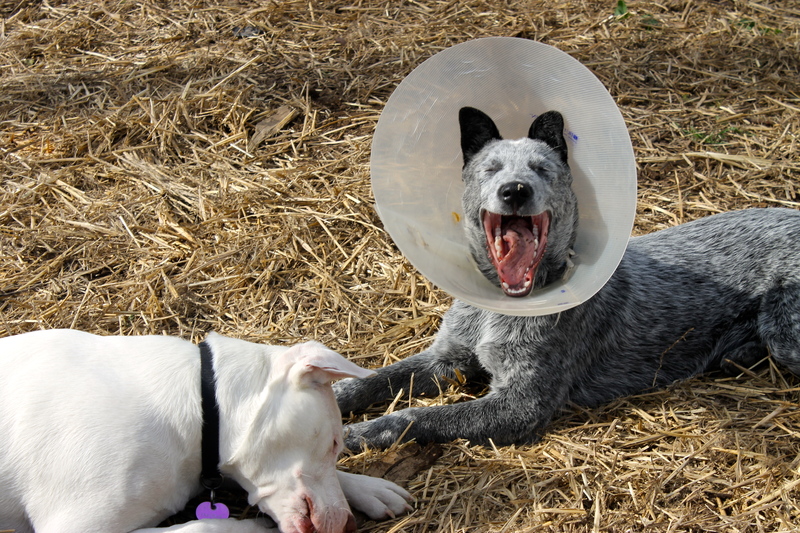 When March 7th rolled around, we saw Moby, a deaf Blue Heeler/Aussie mix with blue eyes, up for adoption! 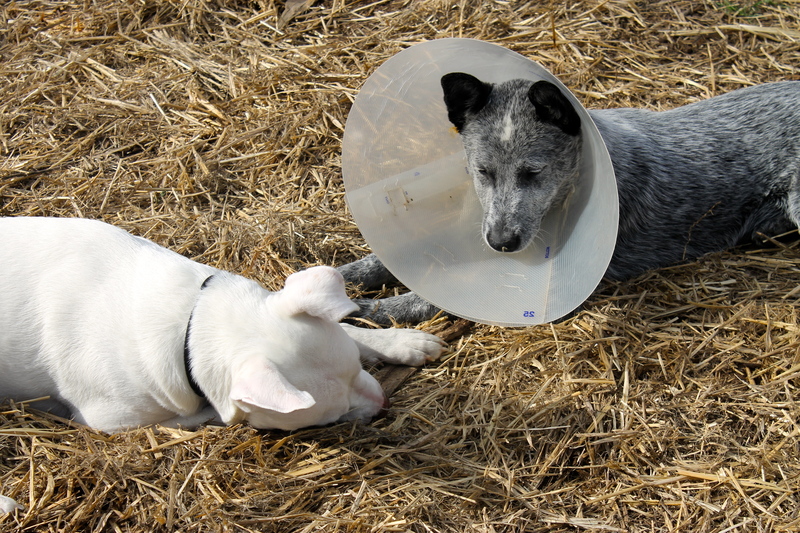 I immediately put a hold on him to see if Hope, my deaf lab would get along with Moby. Sure enough they got along sooo well. 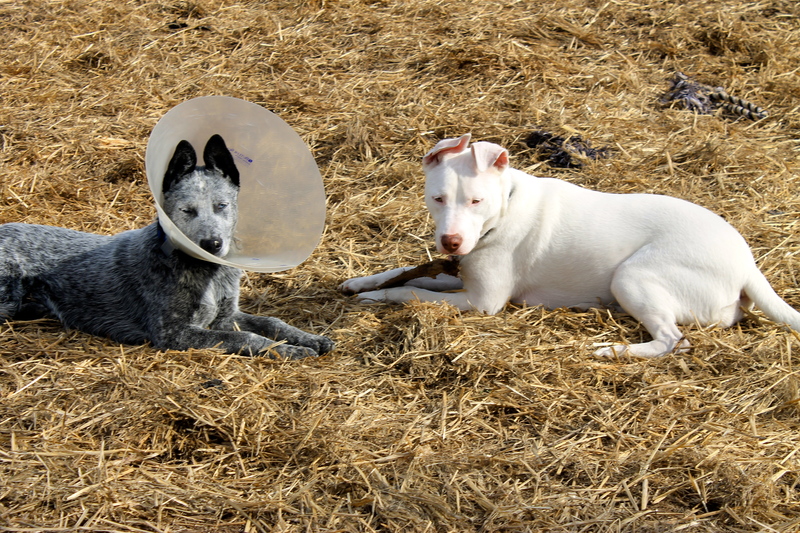 When we brought him home they were inseparable, wherever Hope goes, Moby goes and vice versa. They sleep right next to each other, they play tug a war together, they even share a bone together! 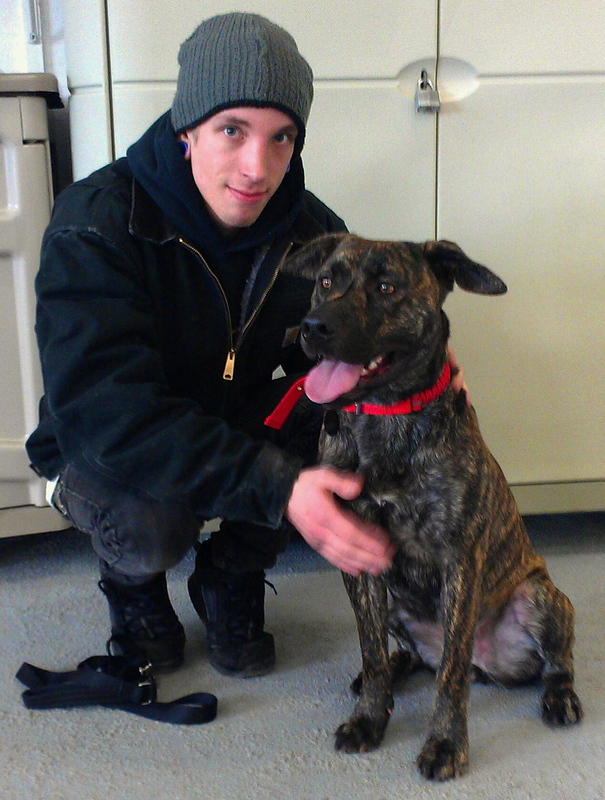 Happy for all your pooches who were adopted, Mart! Martha, What a wonderful job you are doing. I look forward to your postings. I couldn’t believe the “make over” on BeBe and Scooper!! They look brand new!! !